One night near the airport is necessary due to the flight arrival time. 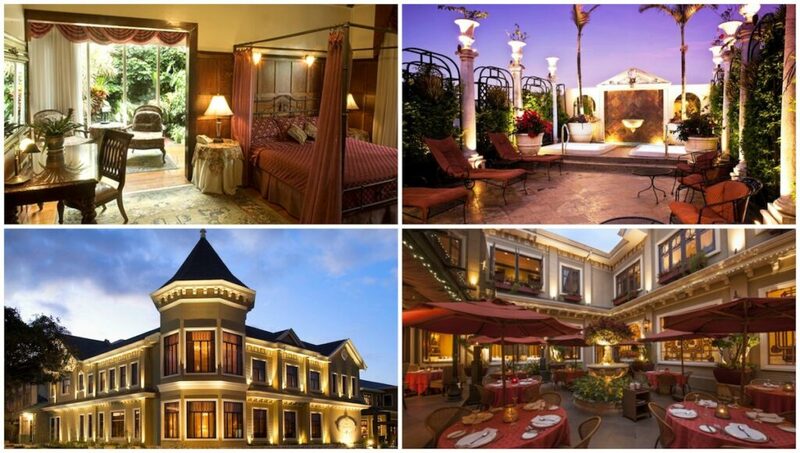 Grano de Oro is our favourite hotel in San Jose with a high standard of service, luxury rooms and the best restaurant in the city. The menu is really creative, with a range of traditional Costa Rican dishes and European-influenced cuisine. This is the perfect treat after a long flight and PSA clients enjoy early check-in and a complementary upgrade (subject to availability). Raft down a crystalline river, flying over rapids and steering through thick jungle, spotting monkeys and toucans swooping through the trees, to arrive at your secluded riverbank lodge; a magical eco-retreat in the heart of nature. 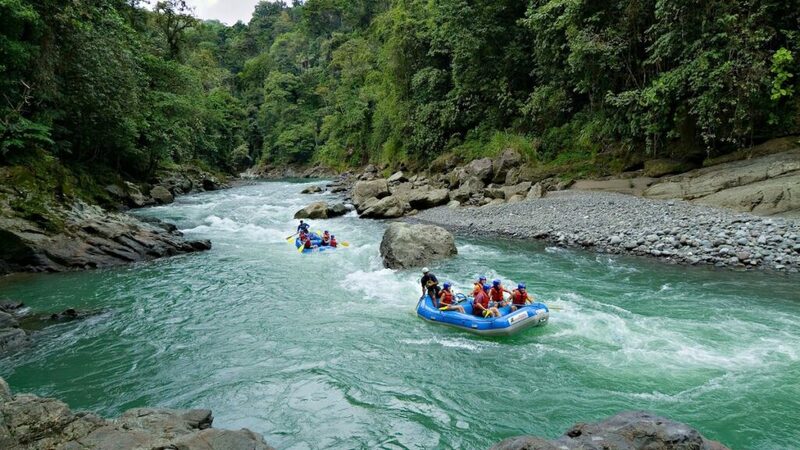 The Pacuare River is considered the 5th best rapids in the world for white-water rafting and the journey to the lodge is thrilling. 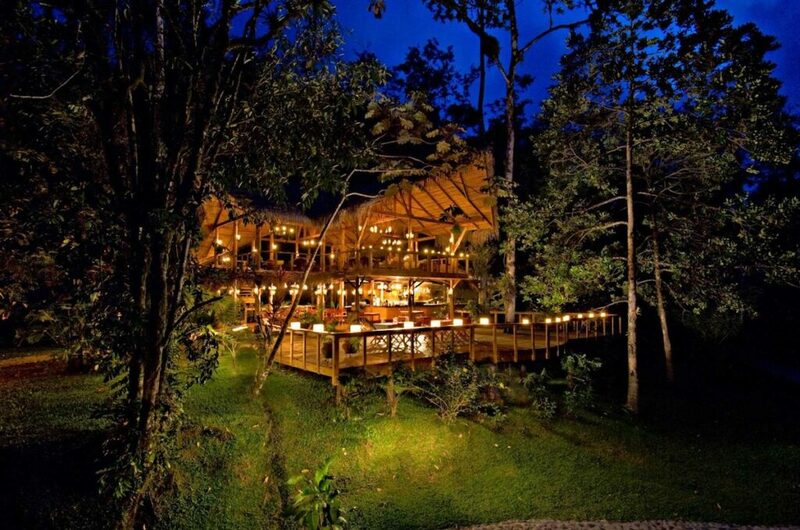 Pacaure Lodge features a series of luxurious treetop suites immersed in primary rainforest. With netted windows, you feel connected to nature at all times, enjoying incredible sights and sounds high up in the sky. Suites are spacious and private, with thatched roofs to blend into the forest and large wooden decks outside each room, where hammock siestas, listening to whimsical birdsong, are highly encouraged. Rise early to sit on your deck with a pair of binoculars and witness the most exciting bird activity as the dawn breaks. Each suite includes a comfortable four-poster curtained bed, hard-wood floors, hand-crafted wooden furnishings, deep baths and a private plunge pool. Pacuare is all about sustainability and whilst there’s limited electricity, the experience is far from basic, with rooms lit magically each evening with hanging lanterns and candles. 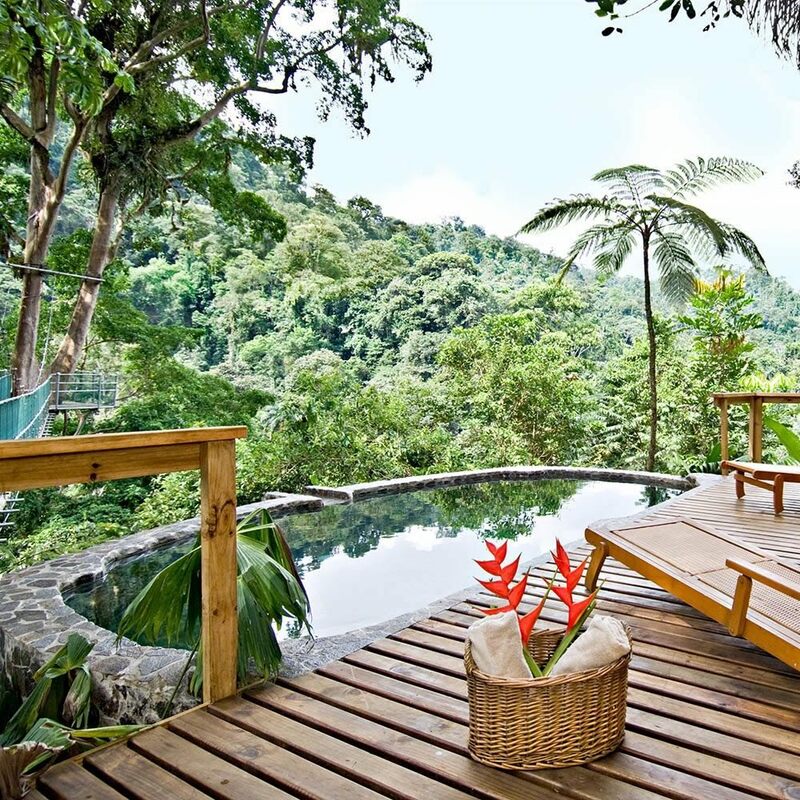 Pacuare has fine-tuned its offering of rustic luxury and every guest is treated to the most spoiling service from the charming owners and their long-serving team. 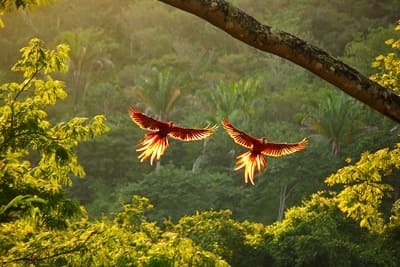 Naturalist guides take hikes into the rainforest; birdwatching, discovering exotic flora and fauna and reaching hidden waterfalls for cooling swims. A list of outdoor adventures includes canopy walks, rappelling and horse-riding. Fine-dining adds to the indulgence of a stay at Pacuare. Enjoy traditional Costa Rican breakfasts and delicious fresh coffee out on your deck watching the forest come to life. The fruits, vegetables and herbs served in the restaurant are plucked right from Las Nubes de Tuis, the hotel’s organic farm. For PSA guests, we arrange special private dinners on the riverbank with a campfire – the atmosphere is spectacular. Pacuare teaches guests to love and respect the rainforest and leads by example with its program of sustainable tourism and efforts to minimalise environmental impact. Don’t Miss: Hike to nearby indigenous community, Cabecar, to learn about their traditions, beliefs and meet the ‘medicine man’ who creates natural remedies from forest plants. The Cabecar people built the thatch palapa roofs at Pacuare lodge and they have a very positive relationship with the owners, working together on initiatives to conserve the rainforest that is their home. Hop aboard a private plane for a short flight to the Osa Peninsula. Internal flights in Costa Rica are an experience in themselves, taking you across the treetops for sensational views over the jungle and coastline (far more exciting than domestic flights in most other countries!). On arrival, catch a boat ride along pristine coastline to Copa de Arbol, an eco-luxury beachfront property, nestled into primary rainforest. Copa de Arbol is located within a wildlife-rich 70-acre reserve on a remote stretch of coastline, close to Corcovado National Park. Just steps from the shore, 1 and 2-bedroom private villas provide a real sense of privacy and interaction with the wild. Villas are rustic in style, made from wood and thatch to be in keeping with the natural environment, yet with modern features, each enjoying air-con, large comfortable beds, walk-in showers and private balconies. Sit out in peace, listening to the birds and taking in the inspiring scenery of the ocean lapping against the shore. The resort’s 4-level infinity pool and jacuzzi is surrounded by a tropical paradise and makes for the perfect spot to relax and sunbathe. Why not try a deep-tissue massage to the sound of the ocean? 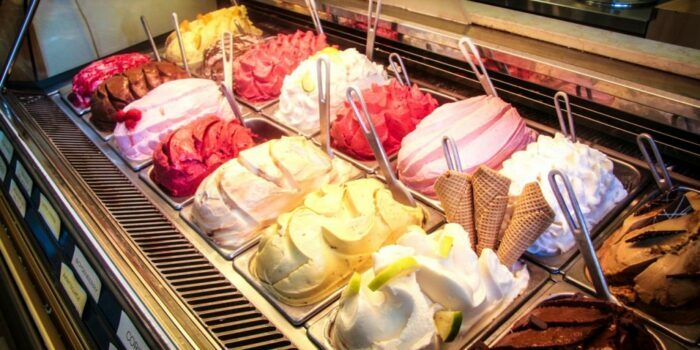 A superb restaurant is set right on the beach, serving fresh fruits and vegetables, seafood caught that day, home-baked breads, delicious smoothies and specialty coffees. Private champagne dinners are arranged above the restaurant with amazing ocean views. 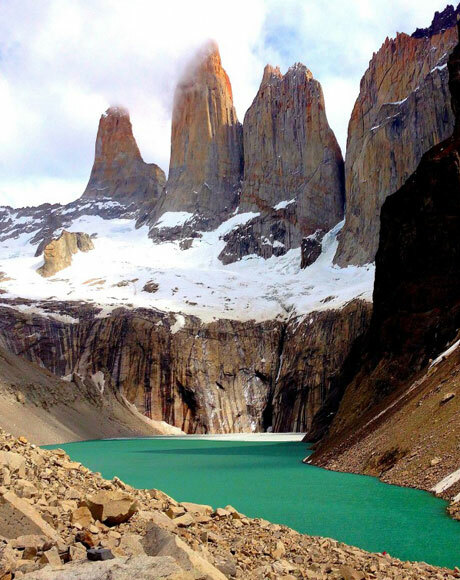 Expert local guides run an array of adventures both inland and off-shore. 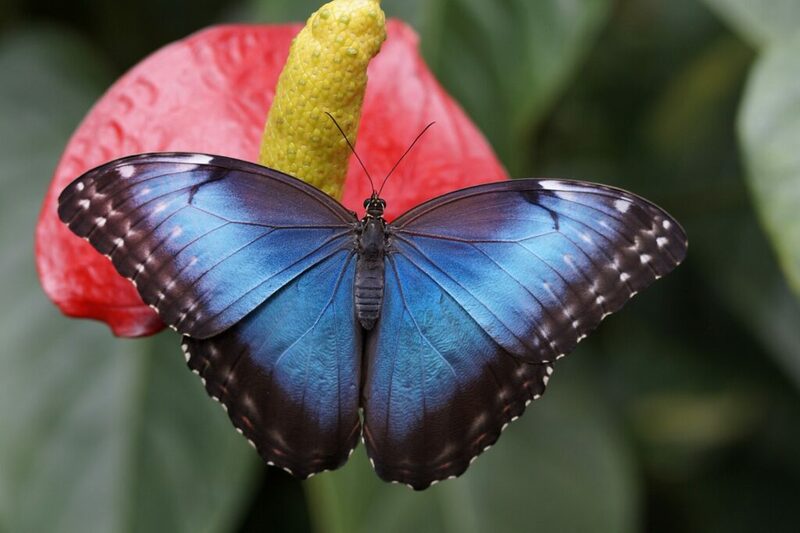 Journey into the rainforest along miles of hiking trails to discover a variety of colourful butterflies, tropical flowers and amazing birdlife, such as the rare scarlet Macaws. Horseback ride along the beach for a picnic by a freshwater lagoon, kayak through untouched mangroves spotting caiman and turtles, snorkel with dolphins and try your hand at sport fishing (it’s a great spot for both beginners and experts). We arrange private yacht charters to explore the untouched coastline and enjoy free-diving, scuba-diving or snorkelling amongst tropical fish and indulging in fresh ceviche prepared onboard. For adventure-lovers, take a hair-raising canopy tour; zip-lining, rappelling and tarzan-swinging through the rainforest – the views are incredible and the feeling of soaring with the birds is sensational. 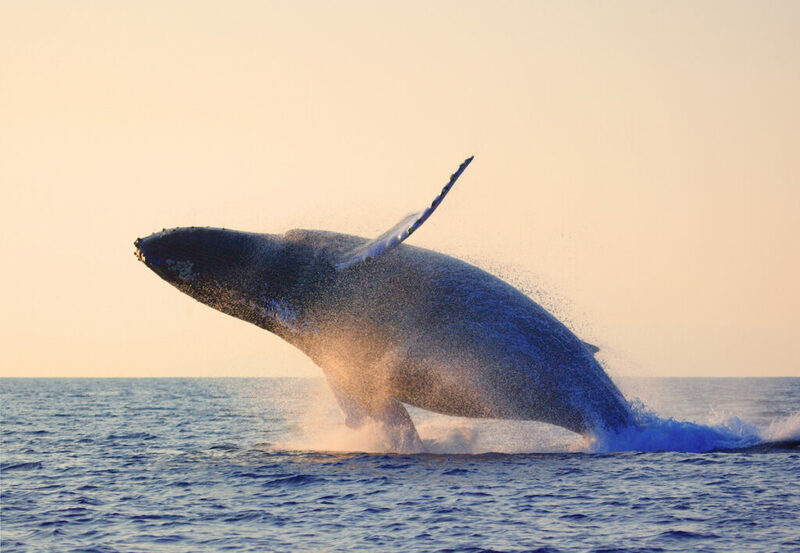 Travel from August to November for a chance to spot Humpback whales. Keen scuba-divers must visit Caño Island, a biological and archaeological reserve 45 minutes away, abundant with coral reefs, marine life and breathtaking underwater landscapes. Accompanied by an expert scuba-diving guide, a delicious beach picnic will be prepared for lunch, with plenty of time to relax before returning home. 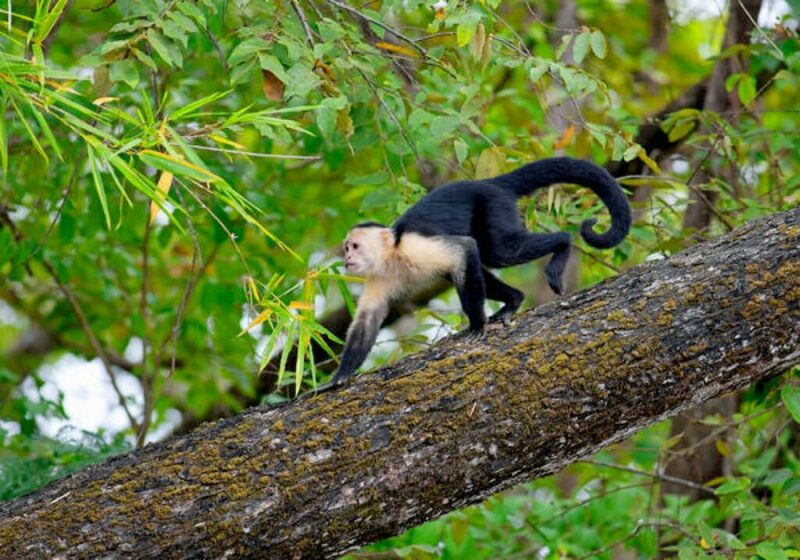 Don’t Miss: One of the most exciting excursions at Copa de Arbol is a night-time rainforest walk to discover amazing nocturnal creatures and the fascinating sounds that can only be experienced in the forest after dark. 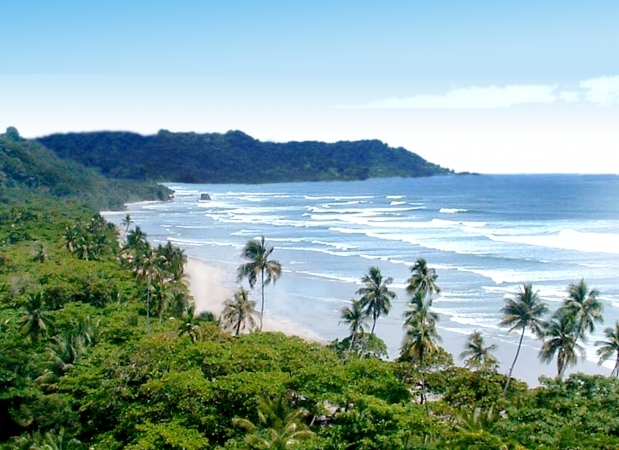 A short, scenic flight along the pacific coast takes you to the Nicoya Peninsula for a stay in the bohemian, beachfront village of Santa Teresa. 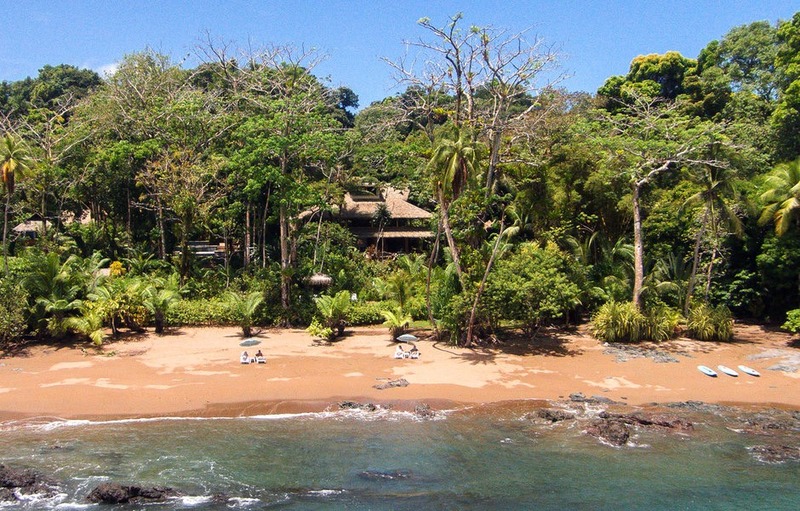 Accessible only by 4×4 or ATV down a dirt track, Santa Teresa is an offbeat, Pacific paradise. The surf is fantastic, sunsets are stunning and fresh seafood is caught daily, to be eaten barefoot in shaded beach shacks. 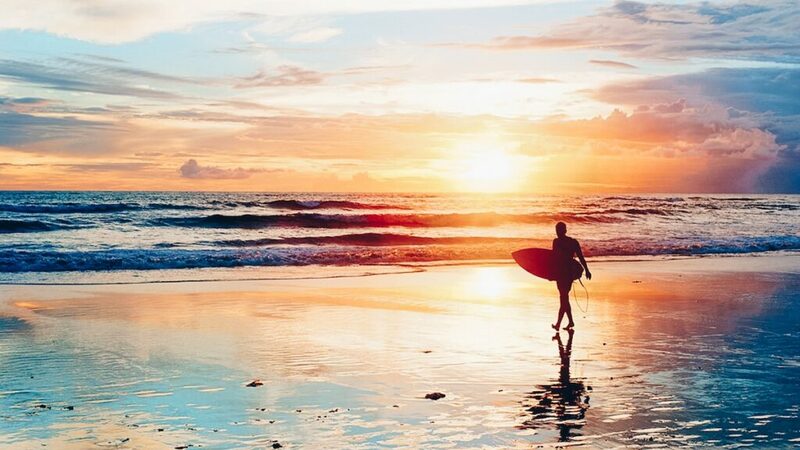 The handful of bars dotted along the coast are bustling with laid-back yoga and surf-lovers, who can’t get enough of these remote shores, far removed from the tourist resorts further up coast. 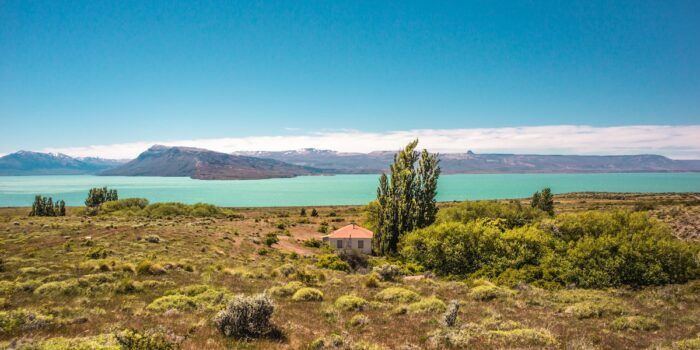 An escapist’s dream, there’s no wonder the elite make Santa Teresa their secret hideaway. Our favourite luxury eco-villa, right on the beach, is La Casona. Set in a beautiful private estate, La Casona sleeps 10 guests* in a colonial-style mansion made of teak wood floors and beams. Spacious and beautifully designed with high ceilings to let in the ocean breeze, La Casona’s interiors feature hand-carved wood furnishings, tropical colours and extremely comfortable 4-poster beds. A spacious veranda provides plenty of outdoor living and dining space, shaded from the heat of the sun. The property overlooks a private swimming pool flanked by palm groves and mango trees, leading straight onto the beach, with views to the ocean. We’ll arrange a private chef, masseuse, surf and yoga instruction on request. Rise with the sun, step straight onto golden sands and spend the day however you please. Laze in a hammock, peacefully watching the tide roll in, take a yoga class under the shade of a towering palm tree, or horseback ride along the beach, splashing through the shallows. 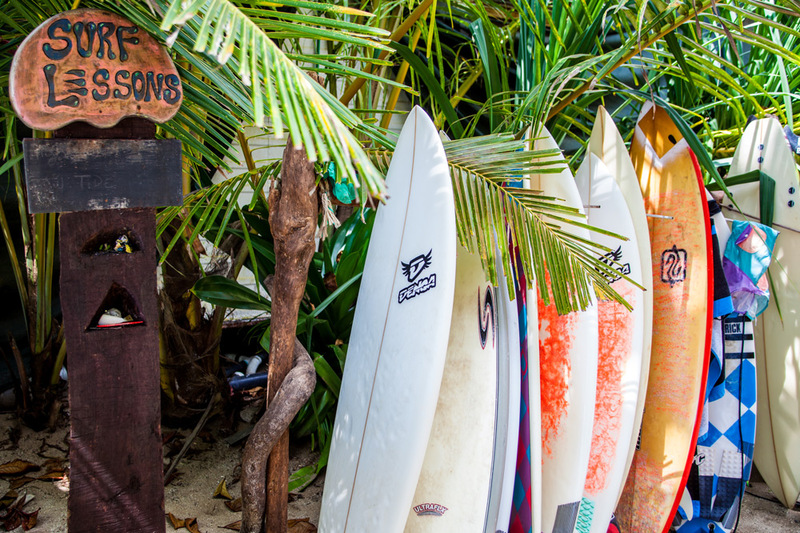 We arrange surf lessons for all levels, as well as deep-sea fishing with local fishermen. Return to cook your own catch on a beach bbq, washed down with chilled Champagne. Don’t Miss: We arrange privately guided adventure experiences in the nearby national parks, from volcano hiking to spotting sloths, jaguars and armadillos in a beautiful eco-reserve, to scuba diving in Cabo Blanco National Park. * An additional 3-bed guest house can be taken next door for larger parties. 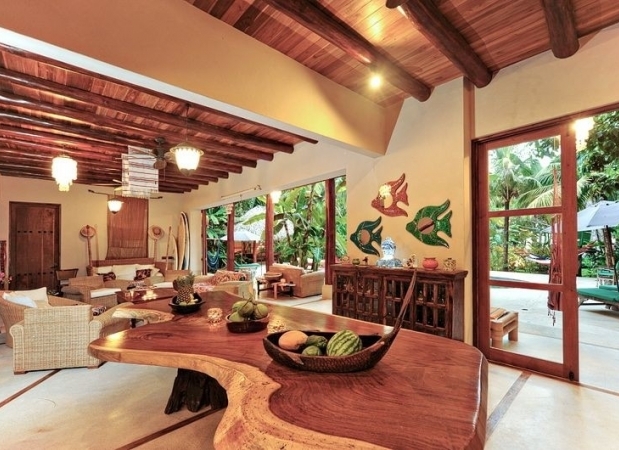 We work with a whole host of private oceanfront properties around Santa Teresa for groups of all sizes. 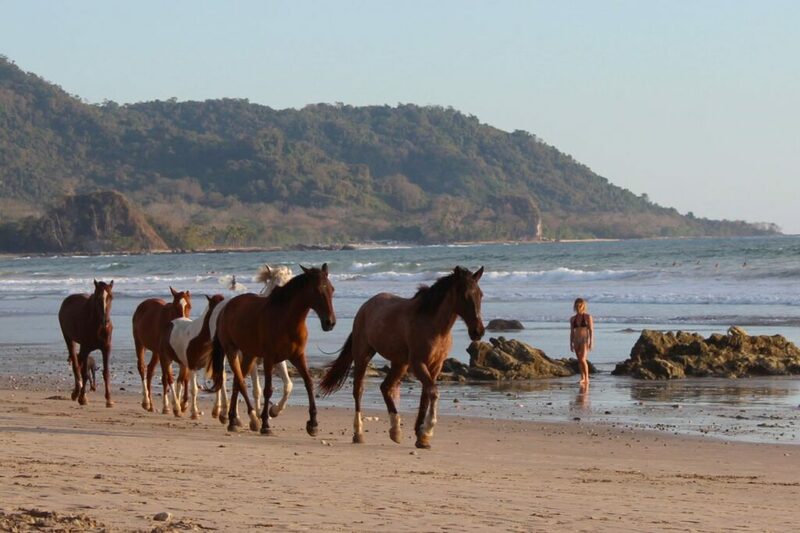 For an extended trip in Costa Rica, spend a few days on a private, family-owned coastal ranch, with morning yoga, beautiful horseback explorations into the primary rainforest and delicious fresh produce from the farm.